Hyde Park, NY – Ben Daitz, co-owner of the Num Pang Vietnamese sandwich shops and managing partner of The Vanderbilt and Brooklyn Bangers, was the keynote speaker at the graduation ceremony at the New York campus of The Culinary Institute of America on September 8. Chef Daitz is a 1998 CIA graduate who also holds a degree in political science from Clark University in Worcester, MA. After earning his CIA degree, he worked with chefs Floyd Cardoz at Tabla and David Bouley at Danube in Manhattan, and Saul Bolton at Saul in Brooklyn. Bolton and Daitz would later become business partners in opening The Vanderbilt and Brooklyn Bangers, and a chance meeting with former Clark classmate Ratha Chaupoly led to the Num Pang partnership. Num Pang has been ranked the top fast-casual restaurant in New York by Zagat Survey and best sandwich in New York by The Village Voice. The reimagined idea of a bánh mì shop now has seven locations in New York City and one in Boston that opened earlier this year. 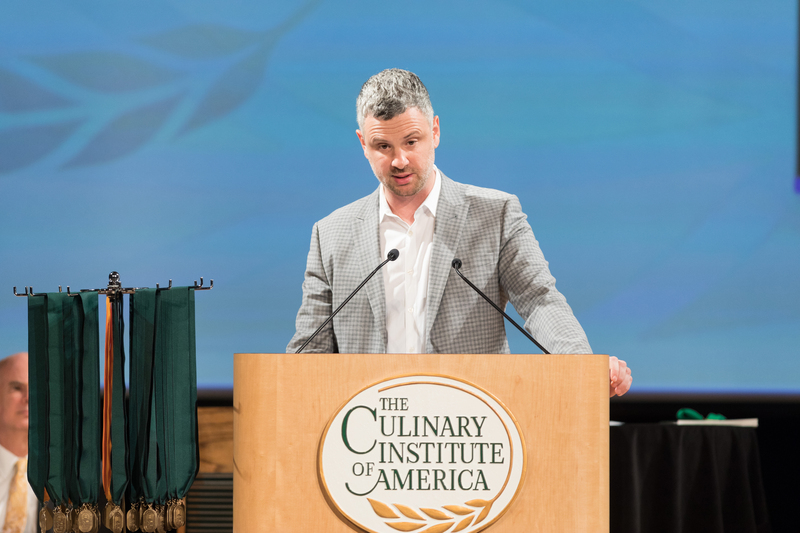 The entire CIA graduation ceremony, including Chef Daitz’s address to 49 recipients of CIA associate degrees in culinary arts and baking and pastry arts, can be seen online.